T-Mobile Galaxy Tab price drop to $249 | Android Blast! With a series of new tablets scheduled to hit the shelves the Galaxy Tab is feeling the heat. Word on the street is that beginning tomorrow, Wednesday, January 26th, the Galaxy Tab pricing will drop to $249.99 with a 2-year agreement from the current price of $299.99. That's $50 off for anyone who is counting. 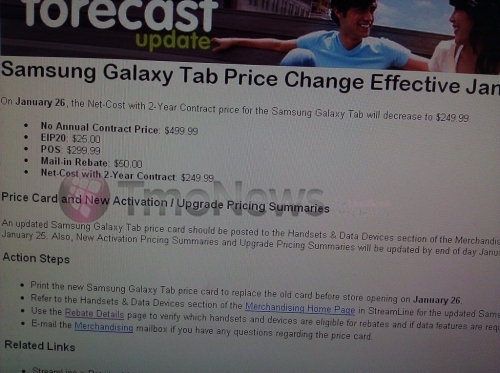 Is that enough of a drop to make you pick up a Galaxy Tab? I'm waiting for the $250 NO CONTRACT price!